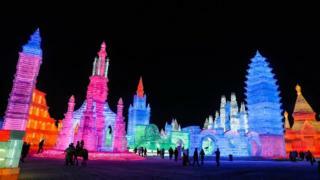 One of the world's largest ice festivals has opened in north-eastern China, featuring frozen castles, glistening snow sculptures and lots of snowmen. 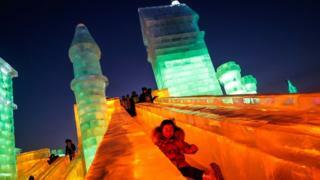 Image caption The Harbin International Ice and Snow Sculpture Festival officially opened on Saturday. Image caption It opened with a fireworks display and a light show. 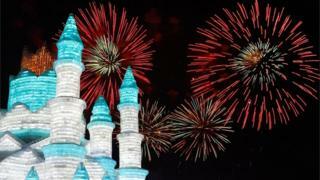 Image caption The festival draws millions of visitors from around the world every year. 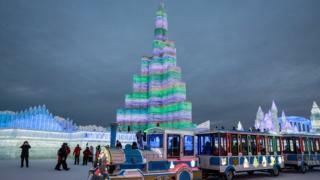 Image caption Some 120,000 cubic metres of ice and 111,000 cubic metres of snow have been used to build the Ice and Snow World. 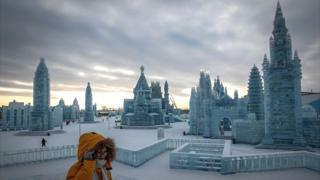 Image caption Thousands of artists and workers built the displays in a city where temperatures can plunge as low as -35C (-31F). 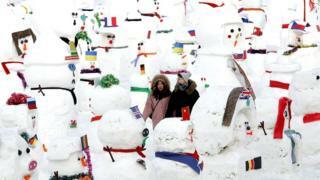 Image caption There are 2,019 snowmen on display on the frozen Songhua River. 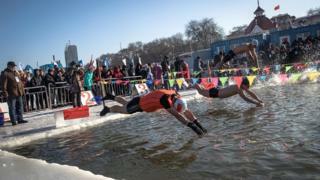 Image caption There is even a winter swimming competition - with more than 300 people braving the chilly waters. Image caption The festival, which first started in the early 1980s, runs until 5 February. 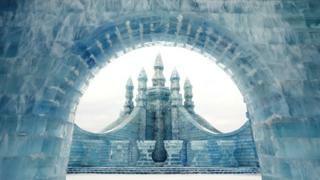 Video What does an ice orchestra sound like?